board, this book offers the best advice, the coolest photos and biggest stars. This book offers you the best advice on getting going or getting better in the radical world of blading, from basic techniques to very cool advanced moves. Real-life advice for real-life challenges facing teenagers. From the Bestselling Author of A child called 'it'. 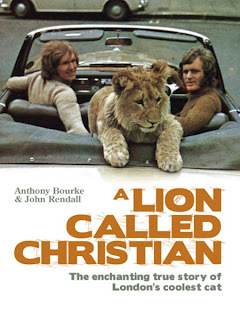 In 1969 two men, Anthony and John, bought a boisterous lion cub from Harrods in London, and the three of them lived together as flatmates. Christian became a local celebrity but he grew to big to keep, so after a chance meeting Christian was flown to Kenya and placed under expert care. Anthony and John returned to see Christian one year later and their incredible reunion can be seen on YouTube. Otello: Black, south America's top footballer. DesmerellaL White, pop star daughter of a right-wing politician. Their sudden and controversial marrige propels them centre stage where they burn under media spotlight. But celebrity attracts enemies......and a young girl is found murdered. If you like the terry Deary horible history books try these. redemption. Kidnappings, gunfights and chases ensure in this extraorninary story of violence, tragic triumph, and unexpected kindness. Kyle Kingsbury used to be the guy you wished you were, with money, perfect looks, and the perfect life until a spell turned him into a beast. Not quite wolf or bear, gorilla or dog but a horrible new creature who walks upright - a creature with fangs and claws and hair springing form every pore. An anthology of original speculative fiction, by some of today's finest writers of fantasy and science fiction. Eddie and Dylan are together again and this time it's serious. they're heading to America for the road trip of a lifetime! Nine weeks stuck in a car together is a test for any relationship. will they last the distance? Jake Hunter's fed up with his new life of superpowered villany. but achrivals, the Council of Evil and the Hero Foundation, don't care. Each side is desperate tio use his unique abilities to defeat the other. Maximum ride now out in graphic novel form. Story includes wierd twins, ghosts, hot new boy. but first she mus get round her mum and dad - officially the most embarrassing parents in the world. Paulo and his wife, Christina, embark on a forty-day quest into the starkly beautiful and sometimes dangerous Mojave /desart, where they encounter the Valkyries, strange warrior women who travel the desert on motorcycles. Cam has a hunger, it drives him from home, to war, from North to South. When he returns from war - alone all his fellow soldiers slain - suspicion swirls around him. He's damaged in body and soul. what has he witnessed? this is a tale of romance, adventure and everyday life in croft and manor house and castle. Charlie moves to a remote, ramshackle cottage and thinks this will cause more problems than it solves, however her first summer their proves to be a turning point for her and her mother, and turns out to be summer that Charlie will never forget. Matteo Alacran was not born; he was harvested. A Matt struggles to understand his existance, he is threatened by a sinister cast of characters. Escape is the only chance Matt has to survive, but he is half-boy half-monster. Tom Loxley is holed up in a remote bush trying to finish his book, when his beloved dog goes missing. The lost dog is a mystery and a love story, an exploration of art and nature, a mediation on ageing and the passage of time. Best friend Ray and Jose are on their own and on the run. they hide out in Ten Mile River, a wildwood Harlem park. The boys ate closer than brothers until they meet Trini, and both fall for her. An interesting novel about survival and friendship on the streets of New York City. Revered writer Alfred Gibson's funeral has taken place at Westminster Abbey, and his wife Dorothea of twenty years, has not been invited. His will favours his children and a mistress over his estranged wife. This was longlisted for the Man Booker Prize 2008.